Goldfinch is singularly focused on discovering and developing precision therapies for patients with kidney disease. Chronic kidney disease (CKD) is a growing, global health epidemic that places an enormous social and economic burden on patients, their families, and society. CKD is a driver of mortality across age, race, and stage of disease progression, affecting over 1 in 9 people worldwide. The impact of CKD is amplified by the fact that It is not one disease, but encompasses several diseases, each with distinct causes. Advances in kidney transplantation and dialysis over half a century ago extended life for patients with kidney failure, yet the current standard of care for patients with kidney disease remains inadequate, and there is an urgent need for new treatment options. Recent breakthroughs in genetics and biology have generated an unparalleled understanding of the biological pathways that drive kidney disease. Goldfinch Bio is uniquely positioned to translate these discoveries into new therapies that target the molecular causes for diseases of the kidney. Goldfinch brings together experts in the field and experienced leaders with a shared mission to pioneer new treatments for patients with kidney disease. Prior to Goldfinch Bio, Tony was head of early clinical development and chief medical officer of the Innovative Medicines and Early Development Biotech Unit at AstraZeneca, and a Fellow at Homerton College, Cambridge, UK. This role was preceded by experience as a venture partner at OrbiMed Advisors and industry positions as vice president, discovery medicine and clinical pharmacology with Bristol-Myers Squibb, vice president, discovery medicine at GlaxoSmithKline and founding director of the GlaxoWelcome Medicines Research Unit. He was a tenured academic at the University of Queensland, Australia prior to his industry experience. Tony received his medical training (M.B.B.S.) and research doctorate (M.D.) at the University of New South Wales and his M.P.H. from the University of Queensland. He is a Fellow of the Royal Australasian College of Physicians and is board certified in internal medicine, geriatric medicine and clinical pharmacology. Prior training included the Rowden White Fellowship (Boston, USA) and time as a visiting academic scholar (Cambridge, UK). Tony was a Board Director for Cardioxyl until acquired by BMS and a Board Observer for Rgenix until he joined AstraZeneca, continuing on their Clinical Advisory Board. He has had 18 years of broad clinical practice. Michael Broxson joined Goldfinch in December of 2017 as chief business and operating officer. Mike brings more than 20 years of leadership experience across finance, strategy, new product planning, alliance management and business and corporate development. Prior to joining Goldfinch, Mike spent 16 years at Takeda Pharmaceuticals, most recently as vice president and head of R&D business development. He has led or played a significant role on over 75 transactions exceeding $25 billion, including the acquisitions of Millennium, Nycomed and Envoy Therapeutics, and he established Takeda’s externalization practice to spin out R&D assets through new ventures and innovative alliances. Mike began his career as a toxicologist for CH2M Hill, a global engineering consulting firm. He holds BA (economics) and MSPH (toxicology) degrees from Tulane University, an MBA from the University of Chicago and is a CFA® charterholder. Mike currently serves on the board of directors of Molecular Templates, Inc. (Nasdaq: MTEM). Frank S. Czerwiec, M.D., Ph.D.
Dr. Czerwiec joined Goldfinch Bio from Otsuka Pharmaceutical Development & Commercialization, Inc. where he was most recently Vice President, Global Clinical Development leading their Cardio-Renal and Metabolic/Medicine group. During his 20-year tenure at Otsuka he was a key contributor to multiple drug approvals and led the global tolvaptan program in autosomal dominant polycystic kidney disease (ADPKD). During his career Dr. Czerwiec has been an active supporter of kidney disease-related research including the Critical-Path’s PKD Outcomes Consortium, Kidney Drug Development Tools Summit and ADPKD Summit. He has contributed to the National Kidney Foundation's Patient Reported Outcome Initiative and ASN’s Kidney Health Initiative. Dr. Czerwiec earned his M.D. and a Ph.D. in Biochemistry and Molecular Biology and conducted his internal medicine residency at the University of Miami Miller School of Medicine before completing his post-doctoral training in translational research through a fellowship in Adult Endocrinology and Metabolism at the National Institutes of Health (NIH) (NICHD & NIDDK). Dr. Mundel joined Goldfinch Bio after serving as a consultant to Third Rock Ventures, where he played an important role in the creation and launch of Goldfinch Bio. He brings to the company more than 25 years of experience as a leader in academic research, most recently at Massachusetts General Hospital and Harvard Medical School. A major focus of Dr. Mundel’s work has been the development of precision therapeutics for patients with kidney diseases through a mechanistic understanding of the cell biology and pathophysiology of the kidney, with a focus on podocytes. Jean-Christophe Harmange joined Goldfinch Bio after serving as Entrepreneur-In-Residence at Third Rock Ventures, where he played a leading role in launching Goldfinch Bio. Jean-Christophe brings more than 20 years of drug discovery, preclinical and early clinical development experience in large and small biopharmaceutical companies. He has led multidisciplinary discovery teams and research and development organizations in delivering several clinical development candidates. Jean-Christophe is co-inventor on more than 30 issued U.S. patents and the author of numerous publications. Prior to his tenure at Third Rock Ventures, he served as the executive director of drug discovery at Constellation Pharmaceuticals where he was integral in building one of the premier epigenetic drug discovery organizations. He also held positions of increasing responsibility at Amgen, Eisai and Servier. Jean-Christophe received his Pharm.D. and Ph.D. in organic chemistry from the Université Paris-Sud and completed his postdoctoral training at Harvard University in Professor Yosito Kishi's laboratory. Lori Rudolph-Owen joined Goldfinch in February of 2018. Lori brings over 20 years of leadership experience in pharmaceutical and biotechnology R&D specifically in strategic planning, program leadership, portfolio operations and driving effective cross-functional collaboration. Prior to joining Goldfinch, Lori served at the Vice President of Portfolio Management and Assessment at TESARO, Inc where she developed and led a team of Development Program Team Leaders, Portfolio Managers and Competitive Intelligence professionals to support the submission, approval and launch for 3 US and 2 European oncology products as well as the filing of 3 INDs. She also held positions of increasing drug development leadership responsibility at Pfizer, AMAG Pharmaceuticals, Abraxis BioScience (now Celgene), MGI Pharma (now Eisai) and Vertex. Dr. Rudolph-Owen received her PhD in Cell Biology at Vanderbilt University. After completing a postdoctoral fellowship, she moved to Boston to join Millennium Pharmaceuticals as an Oncology Discovery Scientist before transitioning over to Drug Development Program Leadership at Vertex. Thomas Tibbitts comes to Goldfinch Bio from an immuno-oncology pharma company where he spent 11 years contributing to a wide range of drug discovery projects, leading structure-guided drug design as a co-inventor on a number of patents for small molecule therapeutics, two of which are currently in clinical development. As the genomics revolution took hold, he built out computational translational genomics to support clinical trials, and helped drive preclinical studies using transcriptomics to elucidate the mechanism of drug action in the tumor microenvironment and provide a basis for rational I/O drug combinations. He brings expertise in genomics, transcriptomics, informatics, software development, image analysis, protein crystallography and cloud computing. As leader of the patient registry at Goldfinch, he is passionate about leveraging his eclectic skill set and experience in genomics to bring new precision medicines to patients suffering from chronic kidney disease. Thomas holds a Ph.D. in Biophysics and has co-authored recent papers in major journals including Nature and J. Medicinal Chemistry. Curtis Demick joined Goldfinch Bio in 2017 as the company’s first vice president and head of Human Resources. With over 25 years of HR experience, Curt is an innovative and results-driven leader who is passionate about developing and implementing the HR strategy and programs that enhance business, team, and individual performance Curt could not be more enthusiastic to be part of the Goldfinch team and champion the company’s mission to transform the treatment paradigm for patients with kidney disease. Prior to joining Goldfinch, Curt served as the senior director of Human Resources with ARIAD Pharmaceuticals where he led the team’s efforts to attract, retain, and develop top talent and provided HR leadership to take the company commercial and establish a global presence. He has previously held senior leadership HR positions in industries across Life Sciences, Marketing and Advertising, Higher Education, and Financial Services. Curt holds a B.S. in Management from Bentley University. John F. Reilly joined Goldfinch Bio in June of 2018 and brings over 18 years of biopharmaceutical leadership and drug discovery experience across multiple disease areas. Prior to joining Goldfinch, John served as Executive Director of Biology at Catabasis Pharmaceuticals, where he was responsible for developing and executing a translational strategy for several molecules with potential applications across multiple rare diseases. Previously he was Global Head of Applied Human Genetics & Genomics at Novartis Institutes for BioMedical Research, where he led a multi-disciplinary department driving advancements in genomic technologies and application to clinical trials across general medicine indications including nephrology. At Merck Research Laboratories, he served as Director of Molecular Biomarkers, led the anti-PD-1 biomarker efforts and was responsible for developing and qualifying biomarker assays to be used in discovery and early-stage clinical trials across multiple programs. John received his Ph.D. in Neuroscience from the University of California and has co-authored more than 30 publications. Liron Walsh comes to Goldfinch Biopharma with a Nephrology and Clinical Development background. Liron has held multiple clinical development leadership roles in both the Nephrology therapeutic area and the rare disease space. Prior to joining Goldfinch, Liron served as a Senior Medical Director at BioMarin overseeing clinical development for two rare-disease programs; enzyme replacement therapy for Pompe’s Disease and gene therapy for Hemophila A. Liron was integral in advancing both programs, serving as the clinical lead for early and late phases of development. Prior to BioMarin, Liron was a Medical Director in the Nephrology therapeutic area at Amgen involved in the development of cinacalcet and etelcalcetide, calcimimetic agents for patients with chronic kidney disease. Liron oversaw multiple clinical studies at various stages of development, most notably, as the clinical lead for two phase 3 etelcalcetide clinical studies, which ultimately led to a successful approval in the US and the EU. Liron received his MD from the University of Toronto and completed his Nephrology fellowship at Mount Sinai in NY in 2010. Our Founders and Advisors are world-renowned scientists and clinicians at the forefront of kidney biology, genetics, and genomics. Joseph Bonventre's research focuses primarily on the study of kidney injury and repair and signal transduction, with a special emphasis on the role of inflammation, biomarkers and stem cells. He has more than 350 original research publications, 150 reviews/chapters and editorials and 3 books. His recent work also involves the generation of kidney organoids from stem cells and their use in kidney disease modeling. He has been elected to the American Society of Clinical Investigation (ASCI), the Association of American Physicians (AAP), the American Clinical and Climatological Association (ACCA) and the American Institute for Medical and Biological Engineering (AMBIE). He is a member of the Executive Committee of the Harvard Stem Cell Institute (HSCI). Joseph is past-president of the American Society of Nephrology and founding member of the Board of Directors of the National Space Biology Research Institute. Joseph has chaired and served on many NIH Study Sections and is Editor of Seminars in Nephrology. He has been awarded the Osler Medal of the Royal Society of Physicians and the Bywaters Award of the International Society of Nephrology. He currently serves as a member of the NIH National Institute of Diabetes and Digestive and Kidney Diseases (NIDDK) Advisory Council. In addition to his B.S. with distinction in Engineering Physics from Cornell, Joseph holds M.D. and Ph.D. degrees in biophysics from Harvard University. He has honorary doctorate degrees from Mt. Saint Mary's College and from the Norwegian Institute of Science and Technology in Norway. He was Director of the Harvard-MIT Division of Health Sciences and Technology for 10 years. Anna Greka leads an interdisciplinary team of students, postdoctoral fellows and staff scientists in laboratories at Brigham and Women’s Hospital, Harvard Medical School and the Broad Institute working on diverse projects spanning ion channel biophysics, pharmacology, cell biology, biochemistry, imaging, in vivo studies and computational biology. Anna currently serves as the founding director of Glom-NExT, a center focused on the development of novel experimental therapeutics at Brigham and Women's Hospital and Harvard Medical School. In addition to teaching at Harvard Medical School, she serves on the Harvard-MIT MD-PhD Leadership Council. Anna has given numerous invited lectures nationally and internationally, and she is the recipient of several honors including a career development award from the American Society of Nephrology, a 2014 Top10 Award from the Clinical Research Council, and a 2014 Young Physician Scientist Award from the American Society of Clinical Investigation. Anna holds an A.B. from Harvard College and an MD and PhD from Harvard Medical School and the Harvard-MIT M.D.-Ph.D. program in the Division of Health Sciences and Technology (HST). She completed her graduate work in the laboratory of David Clapham in work funded by a Howard Hughes Medical Institute (HHMI) Fellowship. Friedhelm Hildebrandt's research work is concerned with the identification and functional characterization of recessive single-gene causes of kidney diseases in children and young adults, including nephrotic syndrome, cystic renal ciliopathies, and congenital anomalies of the kidney. His group has identified over 80 novel monogenic causative genes for chronic kidney disease and delineated the related pathogeneses. Friedhelm has published over 280 original articles in high-ranking journals. He has received the Mead Johnson Award by the Pediatric Academic Societies, the Homer W. Smith Award by the American Society of Nephrology (ASN), the Lillian Jean Kaplan Award for PKD Research, and the Franz Volhard Award. He is a member of the American Association of Physicians (AAP), the German National Academy of Sciences, and the National Academy of Medicine (NAS/IOM), and is an alumnus investigator of the Howard Hughes Medical Institute (HHMI). Daniel MacArthur is a geneticist with a long-standing focus on the use of large-scale genomic data sets to improve the interpretation of human genetic variation, with a special focus on rare disease diagnosis. He led the formation of the Exome Aggregation Consortium (ExAC), a collection of sequence data from over 60,000 people, which has become a critical resource in clinical genetics. He also co-directs the Broad Institute's Center for Mendelian Genomics, and has led the sequencing of over 3,000 members of families affected by rare disease. He has over 15 years of experience in human genetics, including a Ph.D. from the University of Sydney, Australia, and postdoctoral training in genomics at the Wellcome Trust Sanger Institute in Cambridge, UK. Steve Somlo's research interest over the past 25 years has been to understand the genetic and biological bases of human polycystic kidney and liver diseases. His laboratory began with discovering disease genes for autosomal dominant polycystic kidney disease (PKD2), isolated polycystic liver disease (PRKCSH, SEC63) and recessive polycystic kidney disease (PKHD1). His group used these discoveries as the starting point from which to define both genetic and cellular mechanisms underlying the respective human diseases. Steve graduated from Harvard College and the College of Physicians and Surgeons of Columbia University. He did his clinical training at the Albert Einstein College of Medicine and Yale and was on faculty at Albert Einstein before returning to Yale. He is a member of the American Society for Clinical Investigation and Association of American Physicians and is a recipient of the Lillian Jean Kaplan International Prize for Polycystic Kidney Disease Research and the Homer W. Smith Award from the American Society of Nephrology. Abbie Celniker is chairwoman of Goldfinch Bio and partner at Third Rock Ventures, where she focuses on the formation, development and strategy of Third Rock's portfolio companies. Abbie brings over 30 years of experience in R&D and senior leadership roles. Prior to joining Third Rock Ventures, she served as president and CEO of Eleven Biotherapeutics since 2011. Previously, Abbie was the president and CEO of Taligen Therapeutics from 2008 to 2011, when Taligen Therapeutics was acquired by Alexion Pharmaceuticals; following the acquisition, she served as Alexion's executive vice president, translational medicine. She has served as the global head of biologics of Novartis AG, the senior vice president of R&D strategy and operations of Millennium Pharmaceuticals, Inc. and the vice president of protein technologies of the Wyeth Research facilities. Abbie is the chair of MassBio's board of directors and a member of the scientific advisory board for Adimab. She is also a member of the board of directors of the nonprofit Unitio and T1D. She has a B.A. in Biology from the University of California, San Diego, and a Ph.D. in Molecular Biology from the University of Arizona. Dr. Lou Brenner is the president and chief operating officer of Allena Pharmaceuticals (NASDAQ:ALNA). Lou has more than a decade of industry leadership experience in pharmaceutical development strategy, regulatory affairs, business development and marketing with a focus on novel therapies for kidney patients. He has lead successful drug development programs including the Phase 3 program for Feraheme® (ferumoxytol) injection in patients with chronic kidney disease (CKD) at AMAG Pharmaceuticals (NASDAQ:AMAG), the global Phase 3 trial of TYMLOSTM (abaloparatide) for the treatment of postmenopausal osteoporosis at Radius Health (NASDAQ:RDUS), and global strategic planning for Renvela® (sevelamer carbonate) in patients with end stage renal disease at Genzyme. Lou earned a B.S. from Yale University, an M.D. from Duke University and an M.B.A. from Harvard Business School. He completed his residency in internal medicine at Brigham and Women’s Hospital (BWH) and his fellowship in nephrology at BWH and Massachusetts General Hospital. Lou currently holds a clinical appointment and cares for patients with kidney diseases at BWH. He serves on the board of Yale Boston and was formerly a board member at PLC Medical Systems and Chairman of the Board of the National Kidney Foundation’s New England subsidiary. Neil Exter is a partner at Third Rock Ventures, which he joined in 2007. Neil has more than 20 years of business development and strategic experience facilitating the successful development and implementation of operations and collaborations across the spectrum of newly emerging and established biotechnology companies. He plays an integral role in the formation, development and business strategy for portfolio companies. Prior to joining Third Rock, Neil was chief business officer of Alantos Pharmaceuticals, leading the sale of the company to Amgen, and earlier, served as vice president for Millennium Pharmaceuticals, directing in-licensing and M&A. Earlier in his career, Neil held various executive and senior management roles within the high technology industry, including tenures at Hewlett Packard and Wang Laboratories. Neil holds an MBA as a Baker Scholar from Harvard Business School, an M.S. from Stanford University and a B.S. from Cornell University. He is a member of the Research Committee of Children's Hospital Boston, a member of the investment committee of the Innovation Research Fund and Innovation Advisory Board at Partners Healthcare and the treasurer and a member of the board of directors of the New England Venture Capital Association. In addition, Neil serves as a member of the Advisory Council of the Electrical and Computer Engineering Department at Cornell University and the board of visitors of Columbia College. Frank W. Maddux, M.D., F.A.C.P. Dr. Maddux brings more than three decades of experience as a physician, nephrologist, and healthcare executive. He currently serves as CMO and executive vice president for clinical and scientific affairs for Fresenius Medical Care North America, where he oversees the delivery of quality, value-based care for the largest integrated renal care network in North America. Dr. Maddux recently completed a two-year elected appointment as Chairman of Kidney Care Partners, America’s leading kidney care coalition comprising patients, caregivers, providers, researchers and manufacturers. Dr. Maddux joined Fresenius Medical Care in 2009 after the company acquired Health IT Services Group, a leading electronic health record (EHR) software company founded by Maddux. Prior to joining Fresenius Medical Care North America, he served as CMO and senior vice president for Specialty Care Services Group and formerly served as president of Virginia’s Danville Urologic Clinic, where he was a practicing nephrologist for nearly two decades. In 2017, Dr. Maddux was nominated as one of Modern Healthcare Magazine’s 50 Most Influential Physician Executives in the U.S. He holds a BS in mathematics from Vanderbilt University and an MD degree from the School of Medicine at the University of North Carolina at Chapel Hill. Goldfinch is integrating breakthroughs in kidney genetics and biology to identify new therapeutic targets and advance first-in-class drug candidates in the right patient subsets. This is achieved by applying a precision medicine approach to selecting patients most suitable for a given therapy. Goldfinch’s Kidney Genome AtlasTM represents the most comprehensive patient registry to investigate the underlying mechanisms of kidney disease. Through the combination of genomic, transcriptomic, and proteomic data with thousands of anonymized clinical patient profiles, Goldfinch has conducted unprecedented analyses to elucidate pathways and novel targets for kidney disease. Goldfinch’s pipeline of therapeutic programs is underscored by strong genetic validation and a deep familiarity with the biological pathways that cause disease. Our initial efforts are focused on focal segmental glomerulosclerosis (FSGS), diabetic nephropathy (DN) and polycystic kidney disease (PKD). GFB-887 is a TRPC5 ion channel inhibitor in development for the treatment of FSGS. TRPC5 is a calcium-permeable ion channel that has been implicated in the pathogenesis of FSGS by triggering a Rac1-TRPC5 disease pathway. TRPC5 represents a target for therapeutic intervention to halt progression of FSGS to kidney failure. Focal Segmental Glomerulosclerosis (FSGS) is a rare kidney disorder and histopathologic diagnosis characterized by severe scarring of the kidney's filtering units, or glomeruli, leading to proteinuria, an excess of essential proteins spilling into the urine. FSGS is associated with the injury and loss of podocytes, terminally differentiated cells of the kidney glomeruli essential for filtration and proper kidney function. Recent research into the genetics of kidney disease has identified over 30 genes associated with FSGS, and implicates the podocyte as a central player in the pathogenesis of FSGS. There are currently no FDA approved treatments for FSGS. Existing treatments are non-specific, do not alter the progression of disease and carry significant toxicities. Goldfinch is leading the charge to develop treatments targeting the molecular causes of FSGS to drastically improve the lives of patients suffering from this devastating, life-shortening condition. Diabetic Nephropathy (DN) is the most common cause of chronic kidney disease, and affects roughly 40% of patients with kidney disease. DN is the most frequent cause of end-stage renal disease worldwide, and is associated with an increased risk of heart attack, stroke and premature death. Importantly, it may be possible to use Goldfinch Bio’s genetic and precision medicine approach to segment DN and demonstrate effective therapeutics for subgroups of this disorder. Autosomal dominant polycystic kidney disease (ADPKD) is one of the most common single gene diseases, affecting more than 600,000 people in the US and 12 million worldwide. The disease is passed on from parent to child, with each child of an affected parent having a 1-in-2 chance of inheriting the disorder, which does not skip generations. Patients with PKD develop fluid filled cysts in the kidneys that increase in number and size over time, culminating in end stage kidney disease in half of affected individuals by middle age. In the United States alone, 1 in 20 individuals either on dialysis or with a kidney transplant has PKD. Goldfinch is leveraging scientific discoveries based on the known genes that cause PKD to discover treatments that may alter the course of PKD and drastically improve the lives of patients suffering from this chronic and debilitating disorder. It is the patients with kidney disease who will lead us to the understanding of pathways and targets that will drive transformative drug development. 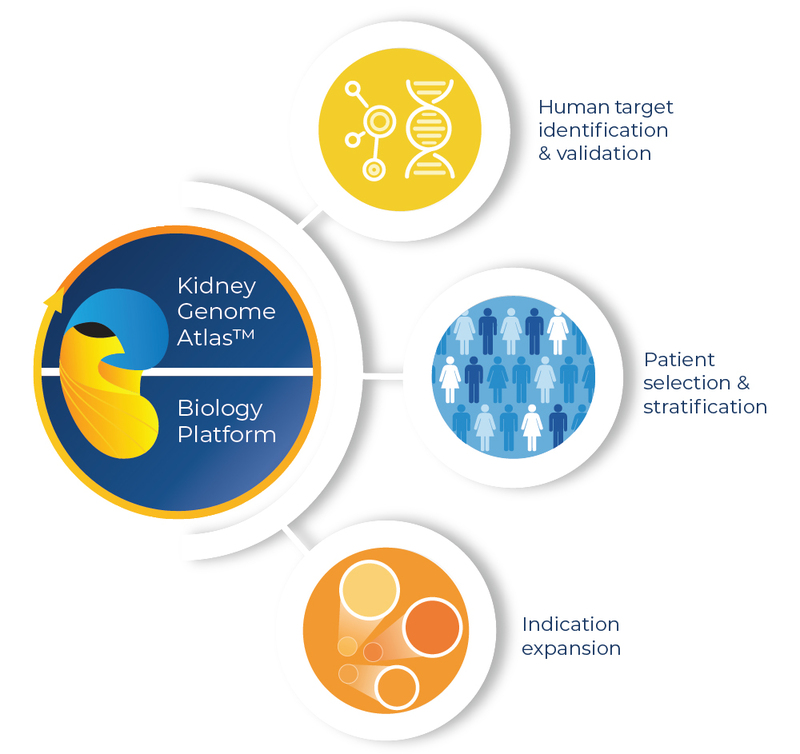 Goldfinch Bio has built the Kidney Genome Atlas, the world’s largest genomic registry of patients with kidney disease to inform new disease targets, pathways, and biomarkers for the discovery and development of novel therapies. In collaboration with premier academic and clinical institutions, Goldfinch has generated genomic, transcriptomic, and proteomic data on thousands of patients with proteinuric kidney disorders, and is pairing the data with clinical records to gain new insights into the genetic underpinnings of kidney disease.